Thoroughly worthy of its Johnny Hodges/Duke Ellington pedigree, in buoyantly swinging ways, “The Jeep Is Jumpin’” kicks off guitarist Andy Brown’s third recording for Delmark. There are several uptempo delights to come, enlivened by Brown’s fluid yet unfussy virtuosity. Swift propulsion and crisp breaks, courtesy of pianist Jeremy Kahn, bassist Joe Policastro and drummer Phil Gratteau, complete the picture. In fact, throughout this session the supporting players provide a lot more than routine accompaniments, as a brisk reprise of Johnny Mandel’s charmer “El Cajon” illustrates. A rhythmically nimble performance laced with quick exchanges, it ultimately proves a splendid showcase for Kahn. If the quartet sounds like a working band, aware of its strengths and clearly practiced at the art of showcasing them, well, a lot of jazz fans in Chicago would be happy to confirm your suspicions. Still, it’s not surprising that Brown chose Stéphane Grapelli and Django Reinhardt’s “Appel Direct (Direct Call)” as the album’s title track, since he takes such obvious delight in its zigzagging lines, leaping intervals, Mile Davis-inspired modulation and abundant verve, to say nothing of Gratteau’s brush-stoke artistry. Appel encore! 4 stars - Classy guitarist Andy Brown follows “Soloist,” his gorgeous solo album on Delmark, with a date featuring his regular crew, which has long held down a long residency at Andy’s Jazz Club in Chicago. From the get-go, it’s a swingin’ affair. Classy guitarist Andy Brown follows “Soloist,” his gorgeous solo album on Delmark, with a date featuring his regular crew, which has long held down a long residency at Andy’s Jazz Club in Chicago. From the get-go, it’s a swingin’ affair. “Catch Me” is a doozy, with bassist Joe Policastro pushing the band superbly. It’s urgent and exhilarating, a nice contrast to “Ela E Carioca,” agent two-beat bossa nova. Of the many moods and moments, check the sympatico counterpoint between the leader and pianist Jeremy Kahn on “One Morning In May,” the pianist’s hipness with chords on “Freak Of The Week” and Brown’s old-school rhythmic shunts and gregarious style on the Grappelli/Reinhardt curio title cut. With Direct Call there'll be no buyer's remorse for bonafide jazz fans. It's sophisticated without being pretentious or pedantic. Moreover, it's soulful, thoughtful music with real character and a showcase for excellent and authoritative artistry...This recording endorses the theory that real talent will always find its audience. This CD, in addition to being an asset to any jazz enthusiast's library, is proof positive that the art form is surviving and being practiced by jazz's finest artists. For this collection, the guitarist called on pianist Jeremy Kahn, bassist Joe Policastro and Phil Gratteau at the drum kit. Discerning Chicago jazz fans can find this exceptional quartet every week at Andy's Jazz Club in downtown ChiTown. What was originally scheduled as a two month gig evolved into a four-year steady engagement that's still attracting a solid following. And this recording endorses the theory that real talent will always find its audience. This CD, in addition to being an asset to any jazz enthusiast's library, is proof positive that the art form is surviving and being practiced by jazz's finest artists. I believe the decades of jazz's "growing pains" are now manifesting and creating the best overall coterie of players ever. And Andy's, a club that's been around for forty years, features jazz seven nights a week with two bands a night. That's one advantage of big city living. The group kicks off the set with Johnny Hodges' swinging riff tune, "The Jeep is Jumpin'" that showcases Andy with some cool non-stop bop inventions before he hands things off to Jeremy Khan, a superb pianist whose creds are as impressive as his improvisation. In fact, the entire group exudes synergy. Each is a virtuoso who listens and responds with complementary ideas and musical dialog, which some say is basically jazz in a nutshell. And I love the choices Andy cites as being democratic. Each player brought cool tunes to the session. And speaking of choices, hip is as hip does; so what many would call a chestnut, "Prisoner of Love" is no museum piece here. Brown at once respects the old tune as he squeezes out every soulful note in lyrical fashion. And bassist Joe Polocastro's arco work is a nice touch as well. Jeremy Khan brought "El Cahon" to the group's attention. It's a Johnny Mandel composition and tribute tune to the late, great tenor player Al Cohn. The title is a clever anagram of Cohn's name. It's a breezy tune featuring some brisk lines from Andy and Jeremy before trading fours with drummer Phil Gratteau whose brush work is nothing short of rewarding. Hank Mobley's bluesy "Funk In A Deep Freeze," affords everyone a stretch on a minor blues from the cool school. You'll hear vibrant solos all around as well as tasteful comping from Khan and a hot 32-bar solo from bassist Policastro, who by the way, grew up with Andy in Cincinnati and was fortunate enough to hone his chops with guitarists Cal Collins and the honest-to-goodness legendary Kenny Poole. The album's title tune, "Direct Call" is a Django composition translated from its original title "Appel Direct." Andy points out its form as AABA with the "A" being one chord and "B" moving up a half step similar to Miles' "So What." Its akimbo lines reminds me of the scampering things Raymond Scott used to write. Phil Gratteau really earns his keep with an imaginative solo that again discloses his tremendous and tasteful brush work. Hank Garland's languid tune "Relaxin'" is not just a surprise but a "letter from home" for me. It's from late guitarist's landmark early sixties recording Jazz Winds From a New Direction that featured a 16-year old Gary Burton, Brubeck drummer Joe Morello and bassist Joe Benjamin. It's an album that influenced countless players including a young George Benson. But it's no surprise that bassist Policastro brought this one to the table. Benjamin's memorable playing no doubt influenced Joe. The group's version is understated yet truly captivating. The group explores Hoagy Carmichael's "One Morning in May" in waltz time with some nice badinage between the guitar and piano up front. Its a lively tempo with a great feel. The set rounds out with "Catch Me" from Joe Pass' debut album, Jobim's "She's a Carioca" and a neat ten-bar blues entitled "Freak of the Week" by pianist John Coates Jr. There are too many highlights in the collection to showcase here. But that speaks to the consistency of the group and the excellent choice of tunes. A big shout out to engineer Scott Steinman at Studiomedia Studios. Phil Gratteau's brush work is always crisp and Joe Policastro's bass is never boomy. Andy says this was a one-day recording session but everything is all there perfectly balanced in a perfect mix. Describing music is like trying to describe perfume. It has to be experienced to achieve the desired effect. But with Direct Call there'll be no buyer's remorse for bonafide jazz fans. It's sophisticated without being pretentious or pedantic. Moreover, it's soulful, thoughtful music with real character and a showcase for excellent and authoritative artistry. Not every jazz guitarist who plays solo can also blow in a group context, and vice versa...Andy Brown joined the league...From the opening licks in Johnny Hodges’ “The Jeep Is Jumpin’,” it appears that a trek to Chi-Town might be in order...Throughout, Brown’s playing is inventive and melodic (not merely a chops display, even on Pass’ speed-demon “Catch Me”), and he extracts a deep, round tone with plenty of definition from his ’65 Gibson Tal Farlow model. Not every jazz guitarist who plays solo can also blow in a group context, and vice versa. Some adept at both include Tuck Andress, Joe Pass, Johnny Smith, George Van Eps, and Earl Klugh. Martin Taylor is arguably at the top of the solo heap, although he’s shown equally impressive facility backing Stéphane Grappelli and on ensemble outings like Freternity. Andy Brown joined the league with 2014’s Soloist. His follow-up, Direct Call, features his working quartet that regularly plays Andy’s Jazz Club in Chicago. From the opening licks in Johnny Hodges’ “The Jeep Is Jumpin’,” it appears that a trek to Chi-Town might be in order. Whether it’s a Latin groove like Johnny Mandel’s “El Cajon” or the Blue Note feel of Hank Mobley’s “Funk In The Deep Freeze,” Brown is right at home, as is pianist Jeremy Kahn, who merits ample solo space. Throughout, Brown’s playing is inventive and melodic (not merely a chops display, even on Pass’ speed-demon “Catch Me”), and he extracts a deep, round tone with plenty of definition from his ’65 Gibson Tal Farlow model. Chicago guitarist Andy Brown has mastered the art of subtlety and elegance. His suave, clean, deceptively simple style is easily recognizable, as is his deeply expressive and vibrant sound. On his fifth release, Direct Call, Brown convenes his regular working band for a varied program of standards that crackle with spontaneity and energy. The boppish “Catch Me,” penned by guitarist Joe Pass, showcases Brown’s virtuosity as his lithe, fast-paced lines unfurl with fiery agility. Brown engages pianist Jeremy Kahn in a witty dialogue and the two exchange crisp bars and clever phrases. Drummer Phil Gratteau drives the tune with his restless gallop, culminating into a thrilling, thunderous solo. Kahn crafts a spicy monologue on saxophonist Hank Mobley’s blues-drenched “Funk in Deep Freeze.” Brown takes center stage for a performance filled with intriguing ideas, blistering notes and a simmering tone. During his turn in the spotlight, bassist Joe Policastro embellishes the melody with his supple pizzicato and buoyant reverberations. There are mellower moments on the album that highlight the close camaraderie among the quartet members. Trombonist Jimmy Guinn’s romantic song “Relaxing” flows seamlessly and with grace from one group member to the next as a genial, poetic conversation. Over Gratteau’s soft brushes and sparkling cymbals, Policastro demonstrates his limber lyricism with a dark and somewhat mystical improvisation. Brown answers with a yearning, emotive soliloquy filled with intricate flourishes and pastel hues. Kahn continues Brown’s thread of thought and expands on it with eloquence and an understated melancholy tinged with joy. With each release Brown continues to exhibit his versatility and high-caliber musicianship. Over his recording career, he has paired up with a vocalist, played solo and “dueled” with another guitarist and has led small ensembles. Regardless of the setting, Brown’s unique and mature instrumental voice uniformly charms and captivates, leaving an indelible mark on all these sessions. It’s the easy telepathy of the group that makes the difference here. A reworked Hot Club theme provides a title track and a very good summary of the album’s appeal. There’s no faffing around and no grandstanding. This gets off to a breezy start, with the Hodges/Ellington line given a boppish flavor. I enjoyed Brown’s “Soloist,” an earlier Delmark release, but it’s the easy telepathy of the group that makes the difference here. A reworked Hot Club theme provides a title track and a very good summary of the album’s appeal. There’s no faffing around and no grandstanding. Individual features are done with a manly reticence. I got something in my eye when Policastro took a little bowed break on “Prisoner Of Love” but it was gone almost before it was there and he was back to keeping steady time and putting in the harmonic piers and piles that support the musical traffic. Brown’s touch is sometimes a little too clean, but it’s good to hear things like Hank Mobley’s “Funk In Deep Freeze” done crisply rather than with too much hot sauce and the other choices are excellent, with Joe Pass’ “Catch Me” a highlight. Warm credits, too, to Kahn and Gratteau, exemplary group players who still manage to sound personal and engaged. Andy Brown, Swing Master: "Appel Direct"
Chicago-based guitarist Andy Brown is in fact a Swing Master...Direct Call I would gladly dub SWING MASTERPIECE OF 2016...I urge you to check out the CD...I believe that you will feel uplifted, rewarded — by the sweetness of PRISONER OF LOVE, the rare energy of CATCH ME...It’s a beautifully integrated quartet, with each player generously giving of himself to the band. When I think of Chicago jazz guitar, I instantly think of Andy Brown...This album is what a studio jazz recording should be all about. It’s sincere, pure, and sounds exactly like a late night live set at a real jazz club...You can hear hints of legends like Wes Montgomery, Lenny Breau, and Joe Pass in Brown’s style but his sense of spacing and dynamics are extraordinarily unique... Brown’s guitar lines and arpeggios are as fluid and lyrical as that of a master class jazz vocalist...If you’re looking for a pure jazz album with no flash and nothing but great music, you must get a copy of Direct Call by The Andy Brown Quartet. This is the real deal. When I think of Chicago jazz guitar, I instantly think of Andy Brown. He’s been a veteran of the Chicago scene for over 13 years now. His new album Direct Call captures the soul and intimacy of Brown’s live weekly performances at Andy’s Jazz Club in the Windy City. The album features the same quartet that plays with Andy at Andy’s consisting of Jeremy Kahn, piano, Joe Policastro, bass, and Phil Gratteau on drums. This album is what a studio jazz recording should be all about. It’s sincere, pure, and sounds exactly like a late night live set at a real jazz club. Brown and his band do tasty and dedicated covers of Johnny Hodges “The Jeep Is Jumpin'”, Hank Mobley’s “Funk In Deep Freeze”, Johnny Mandel’s “El Cajon” as well as the title track which was written by Django Reinhardt. You can hear hints of legends like Wes Montgomery, Lenny Breau, and Joe Pass in Brown’s style but his sense of spacing and dynamics are extraordinarily unique. Jeremy Kahn’s piano accompaniment is swinging and precise. Kahn’s solo on the title track is poignant and masterful. The rhythm backing of Policastro and Gratteau is tight and wonderfully sparse. The ballads really shine on this recording, especially on Jimmie Guinn’s “Relaxing” and Russ Columbo’s standard “Prisoner Of Love” which has the same feel to it as the version Lester Young did with Teddy Wilson on the classic Verve album Pres And Teddy. Brown’s guitar lines and arpeggios are as fluid and lyrical as that of a master class jazz vocalist.The band’s take on Hoagy Carmichael’s “One Morning In May” is syncopated, thematic, and tender. You really feel the strong chemistry between Brown and his quartet on this number. It’s evident that these guys know each other’s styles intimately. The uptempo “Catch Me” swings as hard as humanly possible. Gratteau’s bop flavored drumming is phenomenal and Kahn delivers his most imaginative piano solo on the album. On Jobim’s “Ela E’ Carioca”, Brown plays with the kind of breath and restraint of a true master. This is a soulfully stellar performance on all levels. Policastro’s bass solo is slick, melodic and sticks to the composition’s theme perfectly. This is truly an album highlight. The album closes with the bluesy “Freak Of The Week” written by John Coates Jr .Brown really pays homage to Wes Montgomery here, playing those on of a kind octaves that Montgomery made so popular and the band cooks with sheer joy. 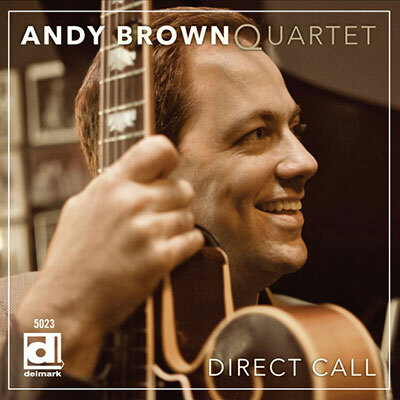 If you’re looking for a pure jazz album with no flash and nothing but great music, you must get a copy of Direct Call by The Andy Brown Quartet. This is the real deal. This music reminds us that the human prehensile grip not only has enabled us to do cool things like fashion spears, paint masterpieces, but also has given us the ability (for some anyway) to play the guitar like a mother...It is an album all guitarists and all their friends will find hard not to like. It boils over with guitar brilliance. You must hear this! Then you must smile! Well, not must, but I do think you will. I did. I am smiling to myself right now! Andy Brown's new quartet album Direct Call (Delmark 5023) opens with a rousing version of the classic Rabbit/Duke number "The Jeep is Jumping" to clear space for an artful set. Brown shows us a refreshing take on electric guitar artistry that owes something to the swing-bop nexus that Charlie Christian made so irresistible and others that came after like Barney Kessel worked through into a modern jazz guitar style. This music reminds us that the human prehensile grip not only has enabled us to do cool things like fashion spears, paint masterpieces, but also has given us the ability (for some anyway) to play the guitar like a mother, and of course to invent and craft the instrument in the first place. So this album makes us glad of that, surely. The album does not rest with "Jeep" but continues on for a program of standards and originals that compliments his earlier album Soloist (type that in index box for my review) with a swinging quartet date and makes us further realize just how excellent a guitarist we have here. He has very sympatico bandmates in pianist Jeremy Kahn (with some greatly swinging and hip solo time and the kind of comping that really drives everything ahead), bassist Joe Policastro and drummer Phil Gratteau. The rhythm gets it all going, setting up the Brown doings in all the right ways. Andy has had all the schooling and knows what to do with it, that is clear. And while he digs into the stylistic block swing-bop he adroitly manages to avoid the cliches and come up with his own performative niceties. It is an album all guitarists and all their friends will find hard not to like. It boils over with guitar brilliance. You must hear this! Then you must smile! Well, not must, but I do think you will. I did. I am smiling to myself right now! ©Copyright Andy Brown. All Rights Reserved.